This is something different from Planet Pleasures ... colorful bamboo tubes are stuffed with very shredable rolled vegeleather pieces! 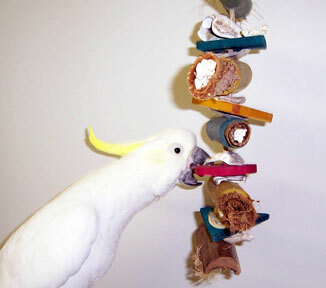 The best part is, when that's gone, you have the perfect place to hide goodies for more foraging fun. We put popped corn in Sydney's toy since that's one of his favorite treats but it's perfect for almonds, pistachios, peanuts or anything else that "fits!" There's also colorful wooden pieces and oyster shell, hung from natural sisal for added texture. 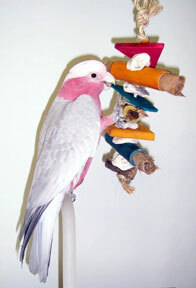 AJ, Rosebreasted Cockatoo (aka Galah) is working on the medium while Greater Sulphur Crested, Sydney, is enjoying the large ... with 3 sizes available, there is one that is perfect for your feathered companion!